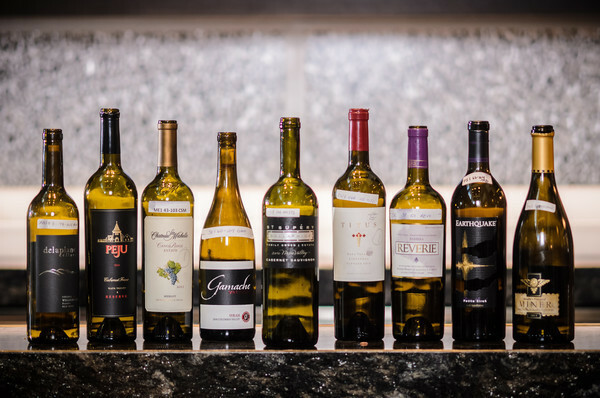 Judges smelled, swirled and sipped a record 766 wines at the American Fine Wine Competition, South Florida’s home-grown national wine event now in its seventh year. Wines from California dominated the competition judged Jan. 19-20 at Florida International University, including the four Best of Show categories; but there were surprises this year when a red wine from Delaplane Cellars in Virginia won Best of Class in the Red Bordeaux Style Blend category; and a Gewürztraminer from Ferrante Winery in Geneva, Ohio, took Best of Class in the Other White Wine category. (A 2008 Pinot Grigio from Ferrante won Best of Show in AFWC in 2010). Many of the winning wines are difficult to find in South Florida, or can only be ordered direct from the winery and shipped here; but they will all be available to sample at a gala dinner and auction for Deliver the Dream on April 4 at the Boca Raton Resort & Club. Tickets are available at americanfinewinecompetition.org, 305-627-3409. The Boca Raton Resort & Club is also offering group rate accommodations, call reservations at 561-447-3000 for details. Maldonado Family, 2011 Los Olivos Vineyard, $42, Napa, Calif., maldonadovineyards.com. Judges’ notes: Vibrant citrus, cardamom, pineapple and delicate floral notes. St. Supéry Estate Vineyards & Winery, 2010 Dollarhide estate, $100, Rutherford, Calif., stsupery.com. Judges’ notes: Big, ripe, showing blackberry, dark chocolate, espresso and a hint of dusty terroir. Mumm Napa Valley, NV, Santana, $50, Napa, Calif., mummnapa.com. Judges’ notes: Complex, toast, peach, green apples, caramel and vanilla, touch of cream. Ceja Vineyards, 2009 Dulce Beso, $40, Napa, Calif., cejavineyards.com. Judges’ notes: Concentration of white peach, tropical essence and citrus accents. Beltane Ranch Wine, 2012 Estate, $29, Glen Ellen, Calif., beltaneranchwine.com. Judges’ notes: Bright, crisp, tropical notes, full bodied. Chateau Ste. Michelle, 2010 Cold Creek Vineyard, $26, Woodinville, Wash., ste-michelle.com. Judges’ notes: Big flavors of blackberry, cassis, black pepper and coffee. Delaplane Cellars, 2010 Williams Gap, $56, Delaplane, Va., delaplanecellars.com. Judges’ notes: Flavors of blackberries and black cherries, coffee and chocolate undertones. Rugg, 2012 $18, Yountville, Calif., ruggfamilywines.com. Judges’ notes: Raspberry notes, pretty, fresh and bright. Miner Family Wines, Rosella’s Vineyard, 2011, $60, Santa Lucia Highlands, Calif., minerwines.com. Judges’ notes: Dried cherry, raspberry and dusty cedar. Peju Winery, 2010 Reserve, $115, Rutherford, Calif., peju.com. Judges’ notes: Black tea, blackberry, cassis and allspice. Reverie, NV, Barbera, $30, Diamond Mountain, Calif., reveriewine.com. Judges’ notes: Dark fruits, rich, delicious, a meal in itself. Michael David, 2011 Earthquake, $28, Lodi, Calif., michaeldavidwinery.com. Judges’ notes: Loaded with dark plum and raspberry flavors and a touch of dark chocolate. Sol Rouge, 2010 Gypsy Rouge, $28, Red Hills Appellation, Calif., solrouge.com. Judges’ notes: Lavender, bright berry notes of strawberry and dark cherry. Gamache Estate, 2009 Gamache Vintners, $32, Prosser, Wash., gamachevintners.com. Judges’ notes: Big, full, dark berry with a bit of pepper and smoke. Ferrante Winery, 2012 Gewürztraminer, $15, Geneva, Ohio, ferrantewinery.com. Judges’ notes: Spice, floral notes, lychee and citrus. Titus Vineyards, 2012, $30, St. Helena, Calif., titusvineyards.com. Judges’ notes: Berries, sweet plum, white and black pepper and anise. Editor’s note: The list of Gold and Silver medalists follow. Results are subject to change or amendments from the American Fine Wine Competition. Key to the results: G = Gold, GG = Double Gold, BOC = Best of Class and BOS = Best of Show. CS = Cabernet Sauvignon; CH = Chardonnay; SP = Sparkling Wine; LH = Late Harvest; SB = Sauvignon Blanc; ME = Merlot; RBSB = Red Bordeaux Style Blend; OW = Other White; SY = Syrah; PS =Petite Sirah; PN = Pinot Noir; CF = Cabernet Franc; OR = Other Red; DR = Dry Rose; RRB = Red Rhône Blend; ZN = Zinfandel. NOTE: Two additional wines were added to this list after deadline. They are: Double Gold to Ramian Wines for the 2010 Cabernet Sauvignon, Gratitude of Five, from the Napa Valley; and a Gold Medal to Parry Cellars of St. Helena, Calif., for a 2010 Cabernet Sauvignon. Watch this space for the complete list of Silver Medalists next week.